The eye-popping “wow factor” of Garlicky Steak and Bleu Cheese Bruschetta is that each slice of baguette is rubbed with a raw garlic clove. Shout out to noblepig.com for sharing that trick. Amazing! And Garlicky Steak and Bleu Cheese Bruschetta is very pretty, isn’t it? It’s a festive and vibrant appetizer for Christmas get-togethers. My family, however, eats Steak and Bleu Cheese Bruschetta all year long. And we would never be satisfied with just a few tastes, so I make enough to serve as a meal. 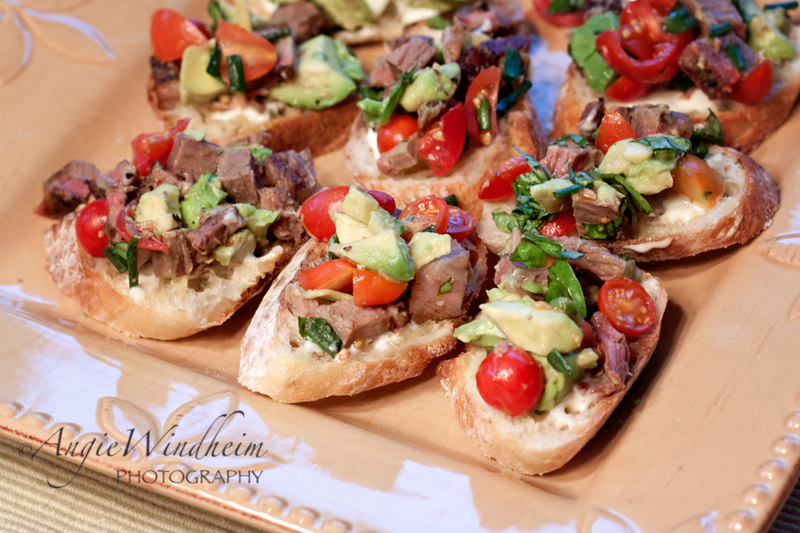 Garlicky Steak and Bleu Cheese Bruschetta is glorious finale with leftovers from a Traeger-smoked brisket. If you are looking for more appetizer ideas, be sure to click on appetizers in my tags or go straight to these two favorites: artichoke dip and bacon-wrapped chestnuts. 1-2 Sourdough baguettes, sliced at an angle for more surface area. Lightly brush each slice of baguette with olive oil and place slices on a large cookie sheet. Bake in oven for 5 minutes to lightly “toast.” Remove from oven and set aside to cool. Rub cloves of garlic over top side of each baguette slice. Melt butter over medium heat in a large skillet. Add steak pieces and heat for up to 5 minutes to make sure steak is completely warmed. Set aside to cool for a few minutes. In a medium-sized bowl, toss tomatoes, chives, basil, avocado and lime juice. Fold in steak and lightly season with coarsely ground black pepper. Spread a thin layer (just a taste) of bleu cheese dressing on each baguette slice. Add one serving spoon full of the steak mixture to the top of each slice. Serve and enjoy!